Trump scrambling to get something - anything - done 100 days into his presidency — United States Studies Centre – he is still scrambling to get something done, like a schoolboy who has put off a term-long project until the last minute. The White House continues to issue vague announcements of impending news on tax reform, healthcare, and the border wall, though nothing has solidified. The last-minute push is unfortunate, not only because it will fail, but because Trump was more right than he knows when he called the 100-day measure a ridiculous standard. Developed by Franklin Roosevelt after an active first three months in office, when he had delivered on his promise of "bold, persistent experimentation", the 100-day measure made sense for a liberal president in a moment of crisis. But history shows that the better yardstick is a president's first year. In the first hundred days, everyone is settling in: staff are being appointed, cabinet members are being confirmed, people are moving into offices and figuring out where the light-switches are. Things don't always get off to a smooth or predictable start. Early stumbles often result in course-corrections. John Kennedy bungled the Bay of Pigs invasion in his first hundred days, but then reworked the administration's crisis response. Early priorities can be upended by outside events. George W. Bush, for instance, came into office warning against nation-building abroad. The September 11 attacks unmade that foreign-policy vision. 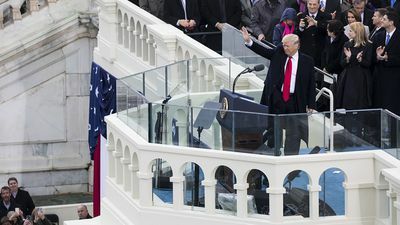 Still, while Trump's first hundred days in office may not predict what will happen in the remaining 1361 days of his term, they do tell us quite a lot about the challenges and priorities of the Trump administration. First, inexperience matters. In drawing up the list of legislation he would pass in the first hundred days, Trump showed very little awareness of how legislating works. It's possible to pass emergency legislation in the first hundred days. Roosevelt rushed through bills on banking, economic relief, and employment. Barack Obama pushed through a stimulus bill. But signature pieces of legislation, the kind that reworks people's relationship to their government, require intensive effort. It takes time and careful planning to properly draft such a bill and to build a coalition to support it. Social security under Roosevelt, tax reform under Ronald Reagan, and healthcare reform under Obama all came well after the hundred-day mark, because they couldn't be rushed. Trump, having never worked in government, doesn't understand this process. Attempting to push through comprehensive healthcare reform in his first hundred days resulted in a quick failure. That doesn't mean the Republicans can't get pass a major healthcare bill, but trying to hurry one through has made the job more difficult. Second, Trump's first hundred days have shown that party unity is a tricky thing. As the rapid unravelling of healthcare reform revealed, the Republican Party is riven with divisions. Those divisions could be concealed when the GOP was united against a Democratic president. But now that the party is expected to govern, those internal fights have spilled out into the public. And yet, party unity has proven to be one of Trump's greatest assets. His historically low approval ratings disguise his soaring popularity among Republicans, whose support for Trump hovers between 80 and 90 per cent. He may have rapidly shed support from the middle – and never had it from Democrats – but so long as he has that unified party support, congressional Republicans can't abandon him. Third, Trump has shown that he cares more about victories than values. Republicans won't play ball on Obamacare repeal? Fine, maybe he'll go over and work on single-payer with the Democrats. (He'll threaten to, anyway.) 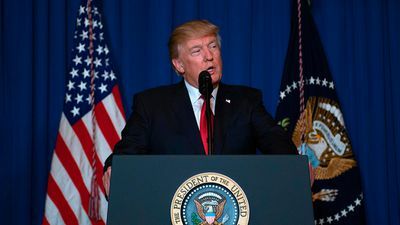 After months of "America First" rhetoric and years of warning Obama against involvement in Syria, Trump reversed course, launching a strike against Syria and soaking in the praise. He likewise abandoned core campaign pledges to brand China a currency manipulator and to make Mexico pay for the wall. "Extreme vetting" has also been abandoned for now, after his travel ban delivered Trump two very public defeats. These promises helped lift Trump to victory in November, but they don't matter much to him now. And that's what makes this early period of his presidency even less predictive than it was for past presidents. Who knows what promises he'll shed and what new ones he'll make? But whether he pursues new promises or old ones, eventually, he'll need to start delivering. "You can't con people, at least not for long," Trump (through his ghostwriter) explained 30 years ago in The Art of the Deal. "You can create excitement, you can do wonderful promotion and get all kinds of press, and you can throw in a little hyperbole. But if you don't deliver the goods, people will eventually catch on." It's advice worth revisiting as his administration marks its first hundred days. This article was originally published by The Age.